Our first officer application window opens 2–3 weeks each year. Create a profile on our JetBlue Careers portal to be notified of when the application window opens. Once the application window is open, review the job description to be sure that you meet the minimum first officer qualifications. Participate in a phone interview. If that goes well, you will be invited to attend an interview to learn more about our JetBlue culture, and share your aviation skills and experiences. If you would like to refer a candidate, please provide them with a written letter prior to the submission of their application. The letter can be uploaded and attached to their application when they apply, as we do consider referrals in the selection process. JetBlue receives a large volume of applications during the application period. If you have applied before and are interested in a position at JetBlue, please resubmit during future application periods so that you remain current in the process. When you resubmit these items you can be assured that we are looking at your most recent and most competitive resume. Candidates are selected by review of application and an interview. If selected, these students will be entered into JetBlue’s University Gateway Program. Once in the Program you will be assigned a mentor that will guide you throughout the process and help you to reach your goal of becoming a JetBlue pilot. You will be required to successfully complete a number of programs and activities to complete the Program, including an internship, flight instruction and time at a regional airline. Your mentor will help guide you through each step of the process. The Program spans seven years. During this time, the student will graduate from the AABI Accredited University, become a Certified Flight Instructor at the student’s university, fly as a Captain for Cape Air or Express Jet to gain flight time and valuable pilot in command experience and then concludes with a guaranteed interview with JetBlue. While not a guarantee of a job as a pilot at JetBlue, most students chosen for entry into the University Gateway Program should successfully pass all phases of the Program and will be strong candidates for selection as a JetBlue pilot. It is an innovative JetBlue program, which trains aspiring pilots for a career at JetBlue. The Program offers the unique opportunity to complete all phases of pilot training with JetBlue. Having looked at some of the best commercial and military pilot training programs in the world, we are pleased to offer JetBlue’s Program participants the chance to learn how to fly complex aircraft using JetBlue standards from the beginning. This allows for a more seamless transition to a JetBlue First Officer position once all mandated requirements are met. In fact, the offer of an E190 First Officer position at JetBlue is made at the beginning of the Program contingent on the successful completion of the Program. We encourage candidates to apply who meet the minimum requirements, are passionate about flying for JetBlue, and who embody the JetBlue values of Safety, Caring, Integrity, Passion, and Fun. The intent of the Gateway Select Program is to place successful candidates in First Officer positions with JetBlue. Under current U.S. law, there are no appropriate employment-based visa categories that would permit JetBlue to offer immigration-related sponsorship for this position. A college degree is not required to apply for the Program. A high school diploma or GED is the only educational requirement. The Program takes approximately 4 years to complete. There is no application fee. However, for those that progress to the second phase of the process which includes an assessment, there is a $160 fee that covers the cost of the assessment. The application window is currently closed. Please stay tuned for the next open window. While detailed results are not released, candidates who complete the assessment will be notified whether or not they will move forward in the application process. We are recruiting 48 trainees in total to fill the October 2019, February 2020 and June 2020 classes. Yes, however the Program is specifically designed to train candidates with no flight experience. All are welcome to apply for the Program, regardless of previous flight experience. However, all Trainees are required to start from the beginning of training, with no waivers for any modules. Thus, all Trainees must complete all modules, including training to obtain a PPL, as well as program-specific instrument ratings. Applicants must be 23 years old in order to obtain an Airline Transport Pilot (ATP) License, which is required of pilots at carriers like JetBlue. Accordingly, candidates must be at least 19 when they start the approximate four year Program; this way they will reach the FAA mandated age of 23 by the time they are ready to be tested for the ATP. The minimum age to apply for the Program is 19. This is because in order for a pilot to obtain an ATP license, which is required to fly for JetBlue, the FAA requires the pilot be at least 23. The FAA requires pilots to be under the age of 65 to fly for an air carrier operated under FAR 121 (such as JetBlue). This Program takes four years to complete. The cost of the Program is approximately $110,000. Payment is due in phases. Wells Fargo and US Credit are two lenders that we have identified that may be of interest to you as a potential candidate. Both lenders are able to provide funding for the full cost of the program, depending on eligibility. To see if you qualify for Wells Fargo financing, please apply via this link. The cost of the Program will be spread out over the first ~12 months, paid in installments at the beginning of each training phase. When trainees become flight instructors, they will be salaried employees of our partner, CAE. We are in the process of trying to get the program approved for GI Bill funding. Check back here for more information as it becomes available. Your tuition and fees cover all training events and necessary supplies (iPad, flight manuals, etc.). Lodging and transportation are provided for the entirety of your training. Food is included in the cost of the Foundation Course and Airline Preparation Course, which take place at JetBlue University. An optional food stipend can be included as part of the program cost and can be utilized during the portion of training at CAE. When you are selected for the Gateway Select Program, you will be offered a contract with CAE, our training business partner. Additionally, JetBlue will extend to you a conditional offer of employment valid upon successful completion of the full length of the Program. We expect to offer three separate start dates in 2019 – February 2019, June 2019 and October 2019 (subject to change, with notice). Although you will have the ability to provide your preference, training commencement will ultimately be a matter of JetBlue’s availability. We would be happy to help coordinate a visit at either the CAE facility near Phoenix, AZ or the JetBlue facility in Orlando, FL for accepted candidates upon request. Each cadet will receive one uniform provided by CAE. All training will be completed at the CAE facility near Phoenix, AZ, and in Orlando, FL. No other training locations are available. Yes. This program is a full-time commitment. The CAE staff and instructors and JetBlue crewmembers and instructors will be available to you. We will also assign you a mentor who can assist you at any time. Your training contract with CAE will stipulate that first-attempt check-rides are included with your tuition, as is 3-percent remediation. What this means is that for every 100 training flight hours, three additional flight hours, if needed, are covered by your fees. Any training required above and beyond that is your financial responsibility. Similar to what some international carriers and military training programs offer, the Gateway Select participants will learn how to fly complex aircraft using JetBlue standards from the beginning. The Gateway Select Program starts with approximately 12 months of classroom instruction, advanced simulation and flight training to cover fundamental competencies: basic flying skills, crew resource management, multi-engine training, multi-crew training, threat and error management, instrument training, severe weather, and non-normal procedures. Participants will attend an instructor course to achieve their CFI/CFII (instructor) qualifications and ratings. Each will then begin to instruct while accumulating 1,500-hours of flight time, the ATP certificate requirement. Following that, and assuming successful completion of all Program requirements, participants will become new hire pilots at JetBlue, where they will go through the same orientation and instruction that all new hire pilots complete. Before the first day of employment as a pilot with JetBlue, Gateway Select candidates will meet all of the FAA's regulatory requirements for an Airline Transport Pilot Certificate, to include 1,500 hours of total flight time. No. Trainees who successfully complete the Program will receive an unrestricted ATP certificate. Yes, you can. Also, to remain in the Program, you must continue to meet original eligibility requirements to have a valid passport and a current FAA Class 1 medical certificate. Tuition for Gateway Select is paid in installments. If you are not successful in completing training, you are not required to make any further payments, and any milestones or certificates you’ve earned along the way are yours to keep. However, you will not receive reimbursement for payments made up until the time you exit the program. Please send your questions to GatewaySelect@jetblue.com and we will answer as soon as we can! No. This program is intended for JetBlue crewmembers only. You must be a JetBlue crewmember for a minimum of one year to be considered for the Gateway. You must receive the endorsement of your crewleader, the System Chief Pilot and the Director of Talent Acquisition to begin the process. Crewmembers wishing to use the Transfer Gateway must complete the same review and interview process of any qualified pilot applicant. No. Only crewmembers in a position which justifies the dual role are eligible for this Gateway. Most often, candidates for this program come from positions including JetBlue University, Flight Operations Leaders and Safety Leaders (among others). Please have a conversation with your crewleader to determine if you may be eligible for this Gateway. Start by sending an email to Transition Gateway to express your interest. You will be contacted with more details at that point. Crewmembers who choose to use the Transition Gateway must fully resign from their current JetBlue position to become a pilot with the guarantee of an interview once ready. Employment as a JetBlue pilot is not guaranteed. The major benefit of the Gateway is that candidates will be guaranteed a JetBlue interview once predetermined flight time and requirements are met. You have up to five years to complete your eligibility requirements. Mentors for the Transition Gateway will be current JetBlue pilots who are a Transition Gateway graduate. 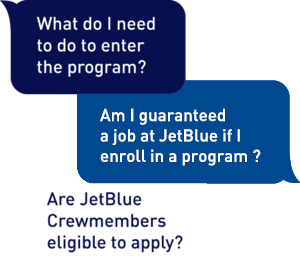 Do you have questions about applying to become a JetBlue pilot or any of the JetBlue Pilot Gateway Programs? Make this your first stop on the journey!